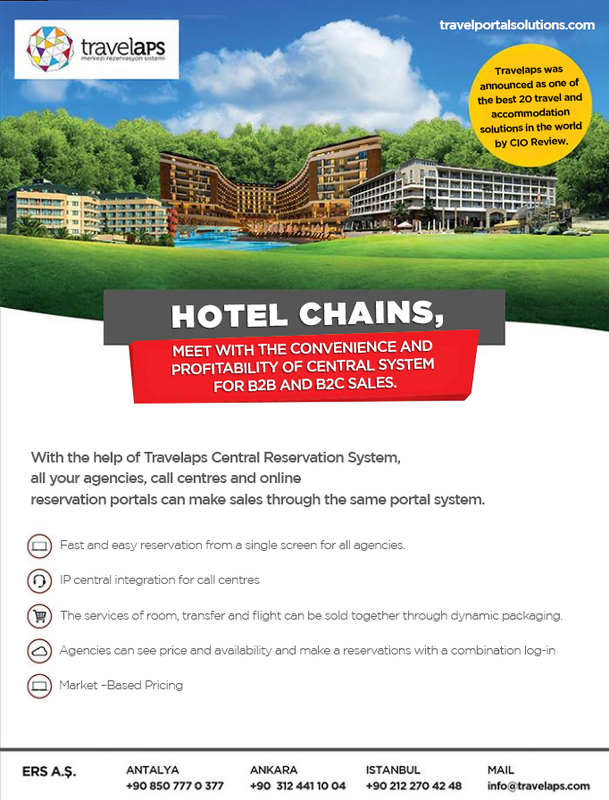 Just after 6 months launching in World Travel Market, November 2015,Travelaps was announced as one of the most promising 20 travel and accommodation systems in the world by CIO Review- one of the most major technology magazines in the world. World’s giant companies such as Lufthansa, Travelport and NEC were annouced by CIO Review in previous years. We are thankful for our employees and clients who have contributed to this success. You can make less costly and more profitable B2B and B2C sales and you can bundle your hotels, flights and transfers in your call centres and web pages and sell them for online payment fee. 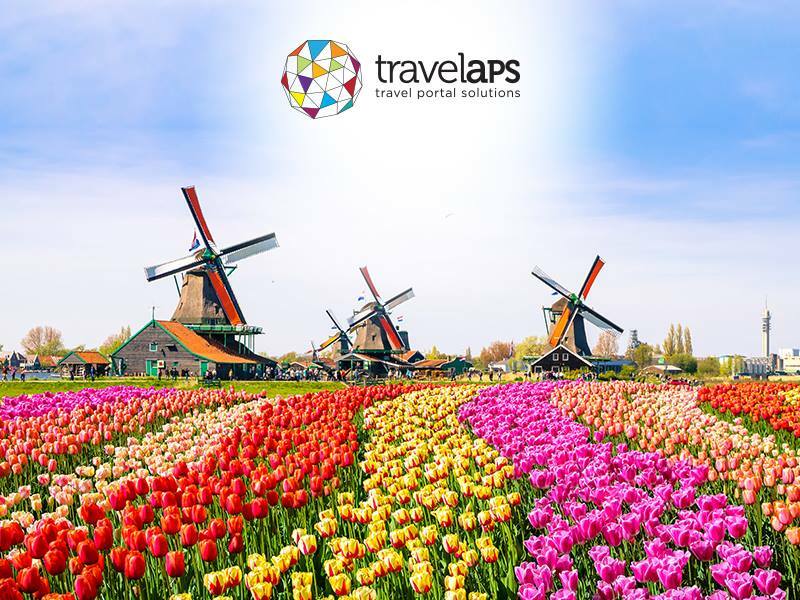 Worlds leading travel portal solution Travelaps now in Holland! 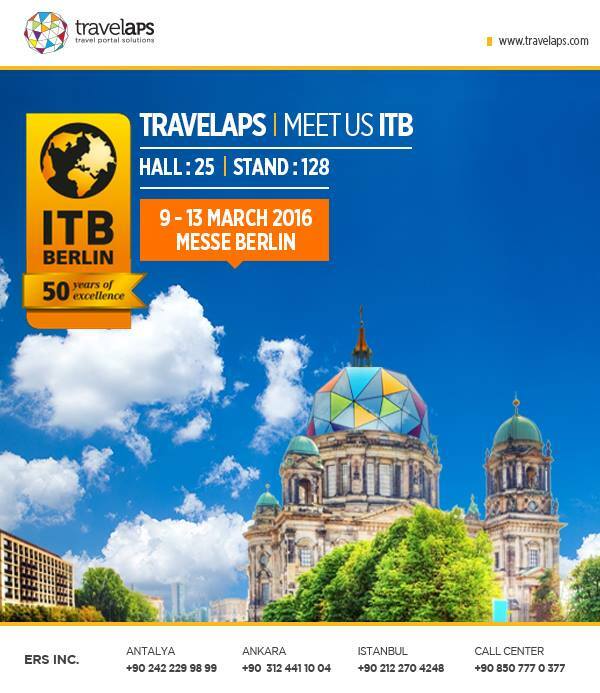 Travelaps at ITB Berlin. Meet us at hall 25 / 128. Now, travel agencies are able to sell their own hotel, flight & tour services with 22 integrated XML services like Galileo, Amadeus, Expedia, GTA by Travelaps. Get Travelaps to reach everyone, to sell all travel services and make more profit! World Travel Market London is an exhibition and meeting area where the travel industry professionals get an opportunity to make new connections and introduce themselves in the global level. Who Can I Meet at WTM London 2016 ? Travel Trade :WTM provides an area where travel trade professional can meet and exchange the information. By this way they gain industry insight and get some new connections. WTM Buyers' Club: Key industry buyers attend to the event to get some information about new and existing products. Press: WTM is visited by approximately 3000 international press members such as bloggers, travel trade journalists, consumer media etc. The international press members visit WTM to report the most up to date business stories. Ministers: In previous WTM exhibitions, a Ministerial programme used to run in association with the UNWTO however for WTM 2016, a new version of Ministers Summit will be placed. 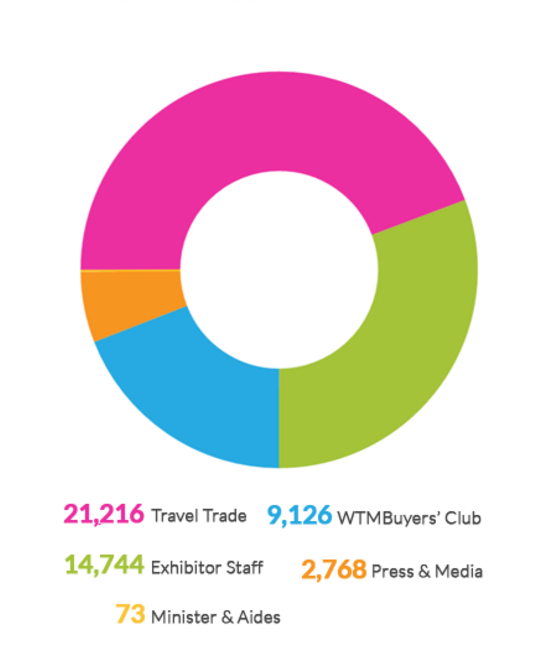 Exhibit or Profile: Every year approximately 5,000 exhibitors come to WTM to introduce their products and services that’s why WTM is a great opportunity for them in order to open to Global area. Exhibitors are segmented accordingly their geographical regions- Africa, Americas, Asia, Europe, Middle East and UK & Ireland as well as the Global Village. ERS is a software company developing travel portal solutions and hotel reservation systems for travel agencies, tour operators and hotels. Travelaps is the online selling solution which offers low-cost and fast-start opportunities for travel agencies, tour operators and hotel chains. 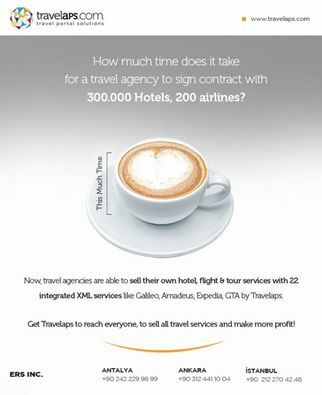 The big advantage is that TravelAps.com can be used for B2C, B2B and B2E purposes. Customised Website Design accordingly the features of your own brand. A comprehensive Back-office with flexible Contract Management, Integrated Accounting, CRM, CMS and Digital Marketing modules make the running of your business become much easier. In each of these fields, there are qualified professionals you can depend on. Thanks to using the latest technology the travel portal you will get will be complete and useful. Hotel Reservation Systems "RezervasyonAl - Booking Engine & Channel Manager"
It is the most ideal reservation engine for your hotel website. It contains assuring user-friendly and fast interface. With the help of its developed infrastructure, it is very easy to manage the details. You can make low cost and more profitable B2B and B2C sales and you can make dynamic packaging of your hotels, flights and transfers from your call centres and web pages and sell them for an online payment fee. You can send price and availability to the agencies and institutions you work with for 7/24. Due to partner with Microsoft USA on accommodation solution, Travelaps co-brands with Microsoft USA. 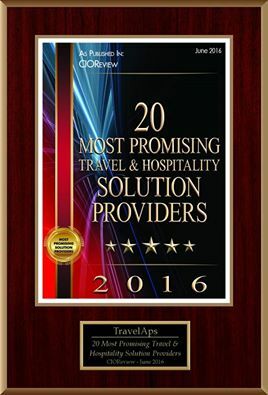 Travelaps was announced as one of the most 20 accommodation and travel solutions of the world in 2016. World Travel Market London will be held at ExCeL London between 7 - 9 November 2016. ExCeL London is an exhibition sand international convention centre located on the northern quay of the Royal Victoria Dock in London Docklands, between Canary Wharf and London City Airport. What days will WTM London 2016 takeplace on? The exhibition will be open from 10am – 7pm on all three days. Will the exhibitor invitation-only policy for the first day of the event remain? Buyers and visitors will need to be invited by exhibitors on Monday 7 November to gain entry to WTM London. Tuesday 8 – Wednesday 9 November will remain open days for everybody who works in the travel and tourism industry. Are there any changes to the Events Programme? The events programme will run across all three days of WTM London with the bulk of the content taking place on Tuesday 8 and Wednesday 9 November. The key change for WTM London 2016 is that WTM World Responsible Tourism Day will take place on the Tuesday, swapping days with the UNWTO and WTM Ministers’ Summit, which will now take place on the Wednesday. The WTM Speed Networking for buyers and exhibitors will take place, as usual, on the Monday morning before the exhibition floor opens. The WTM Bloggers’ Speed Networking also moves to the Wednesday morning. The event will conclude with the WTM Festivals. Are there any other changes to WTM London 2016? A new amphitheatre for up to 300 people will be built on the exhibition floor. This new theatre along with the WTM Global Stage will host the majority of the events programme’s content on the exhibition floor. It is a travel portal solution for travel agencies who want to move their business online. We are a leading software development company that is specialized in travel portal development , xml connectivity, reservation booking engines . Our team is composed of travel industry professionals, academics and specialized IT developers. We cooperate with almost all world wide whole salers and make our travel portal XML/API connectable to all. Because registering to our cloud system and configuring all XML and payment services according to company credentials is enough to integrate all world. On the other hand we provide very functional but easy user interface for entering and managing its own contracts . Last thing to do is to direct its domain to travelaps.com servers and start selling online. Our servers are in Amozon Web Services so they are very fast, their uptime is the highest in the world and secure. We offer your travel company an online travel portal with XML connection to world hotels, flights, transfers and tours. Simply we offer the best solution at lowes cost. 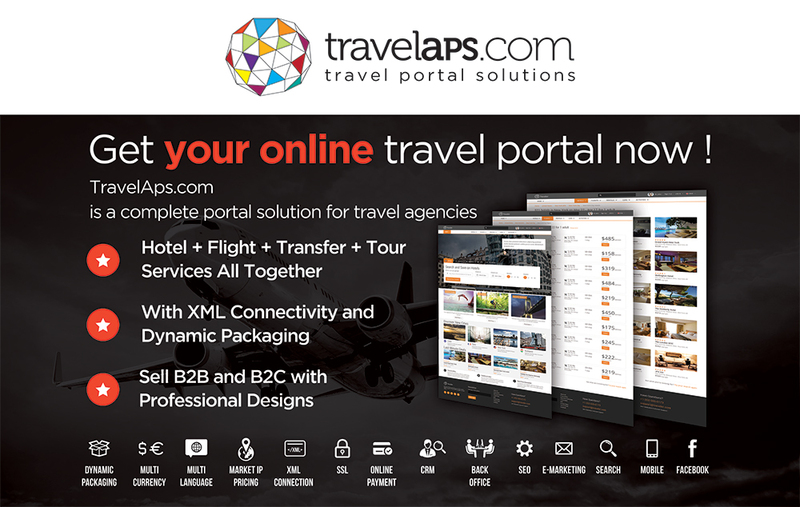 Because TravelAps is the most comprehensive online travel portal solution with latest technology and a great variety of XML services and an integrated back office system. On the other hand our solution is very reliable and affordable since it is used in hundreds of online portals upto now meaning it is tested and tuned to best performance and development cost is almost none for new buyers.